Inder Loves Folk Art: Sewing a men's shirt. I have a confession to make: I've never sewn anything for my husband. There. I've said it. I know what you are thinking: "That is so wrong!" I mean, I've made things for almost everyone else in my immediate family at some point - I've even sewn gifts for coworkers and acquaintances at times. But it's true: I've never made Steve anything that couldn't be eaten immediately. And Steve is not above reminding me of this fact periodically. The main reason I've never made anything for my husband is that Steve is a simple dude. He doesn't really need anything. If he needs something, he gets it for himself. So I've never known what to make him. Then recently, I noticed that most of his clothes have giant holes in them. 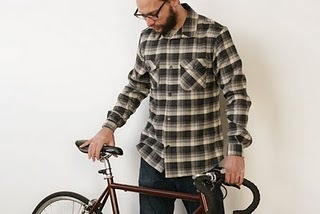 His favorite flannel shirt is completely worn through on the elbow. Ah ha! I'll make Steve a shirt! 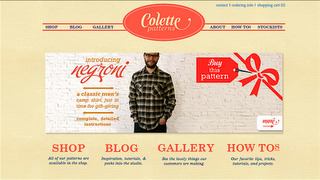 A nice cozy flannel or corduroy shirt like the ones he loves to wear over his t-shirts in the winter. Well, folks, I am about to find out!! I can't let Steve down now! Crappy buttonholes or no, I will make him a shirt! And since his other shirts are falling off his body in tatters, he will probably wear whatever I make him. That's a comfort. I love it in the plaid flannel pictured here, but I think this project will be challenging enough for me without having to match plaid, so I chose a soft chocolate brown corduroy with a little stretch for the project. When I read that the pattern calls for nine buttons, I just tried to breathe through the anxiety. 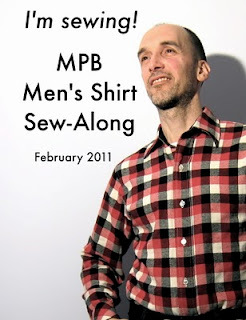 And then, a few days after I ordered the pattern and started making my plans, Peter over at Male Pattern Boldness, a sewing blog that I follow, announced that he was going to be doing a mens' shirt sew-along! Using this EXACT PATTERN. So now I will enjoy the benefits of step-by-step instructions from a far more experienced seamster/sewist than I! Kismet! I tell you, this was meant to be. I am so excited. A fun new challenging project, that will hopefully result in a better dressed husband! Awesome! My excitement will probably last at least until I make my first major, irreparable mistake. That's usually how it goes. Buttonholes only *look* intimidating, they're easy : ) ive been looking at this pattern and totally wanting to make it. I can't wait to see how it comes out. This reminds me of that romantic story the watch and the comb. Who's more loving? The wife who sews a shirt or the husband who wears it. Ha. I once had a copy of a 1970s Good Housekeeping, the cover story of which was "Knit him a Nifty Top!" And then there were all these hunky models inside, posing in "nifty tops." I just couldn't throw it out. But I did promise my husband I would never ever sew him a nifty top. I also worked with this really awful chauvinist pig once, who was very old school and always cracking rude jokes and smoking cigars. His one redeeming feature was he always wore sweaters his wife knit him. Like, peach colored with little sheep and such on them. I just couldn't hate him for that reason. Anyway, good luck! You're a bolder seamstress than I, by far. I'm sure it will turn out smashingly!